Just three days to a smile...in there somewhere! Yep there is a big cheesy grin under that helmet somewhere trust me! 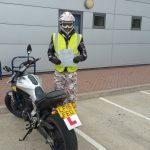 Well done Kesley Watson from Crawley, a couple of trainng days and you breezed your tests on the third – check you out!